The United States was the only country in the world that voted Wednesday against the United Nations investigating human rights violations in Gaza unleashed by Israel’s military assault. Of the 47 members of the UN Human Rights Council, 29 nations voted to set up a commission to launch an international, independent inquiry, effectively passing the resolution. 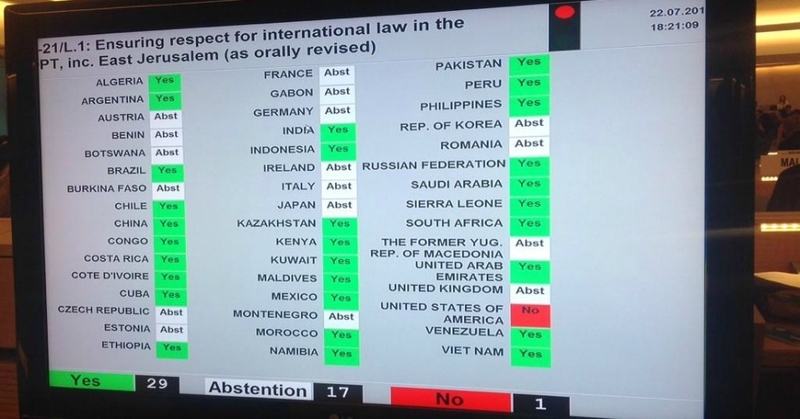 Seventeen countries abstained, including Germany, France, and the United Kingdom. But Josh Ruebner, policy director for the U.S. Campaign to End the Israeli Occupation, toldCommon Dreams that the U.S. vote simply “shows the great extent to which the U.S. goes to protect Israel in international forums from any accountability for its actions, no matter how egregious.” Ruebner added that U.S. claims of imbalance are illegitimate, as the inquiry will investigate human rights violations perpetrated by Hamas as well as Israel. The UN resolution comes amid an ever-rising Palestinian death toll, with Gaza Health Ministry official Ashraf al-Qudra reporting Thursday that so far 784 Palestinians have been killed and over 5,000 wounded in Israel’s “Protective Edge” operation. Kyung-Wha Kang, Assistant Secretary-General for Humanitarian Affairs and UN Deputy Emergency Relief Coordinator, estimates that 74 percent of the Palestinians killed are civilians and one-third are children. “One child has been killed each hour in Gaza over the past two days,” Kang said on Wednesday, according to the UN. Thirty-two Israeli soldiers, two Israeli civilians, and a Thai worker in Israel have died.